Surface Annulus Safety Valve (HSAS) > PTC - Well head, Gaslift, and Chemical injection for improved well performance and integrity. HSAS-G system with the hydraulic actuator installed inside an API gate valve. HSAS-G is designed for applications where piping modifications are not desired or possible to perform. HSAS-R system is installed in a unique spool with bleed off/pump in ports and a means of attaching a service gate valve. This solution eliminates the need for annulus line gate valves. HSAS-R and VR Sense installed on a wellhead eliminating the need for annulus line gate valves. Wells with planned or unplanned sustained annulus pressure (SAP) pose a considerable risk to personnel and facilities. In these situations, annulus line gate valves (a gasket, bonnet seal or stem seal) are the primary well barrier envelope elements, with no back up in case of failure. Most O&G companies follow a double barrier well integrity management policy. In wells operated with SAP the single barrier gate valves are in breach of this policy. Annulus line gate valves also significantly increase the ‘footprint’ of the wellhead. They require regular testing, maintenance and occasional replacement, resulting in significant life cycle costs. 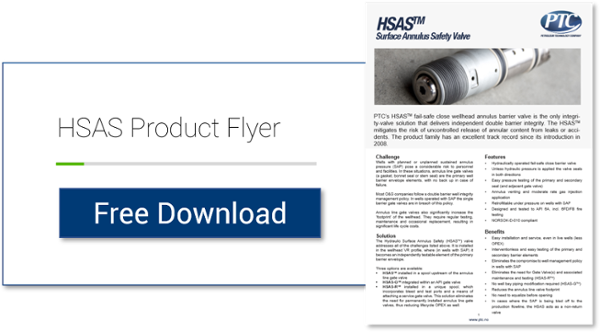 The Hydraulic Surface Annulus Safety (HSASTM) valve addresses all of the challenges listed above. It is installed in the wellhead VR profile, where (in wells with SAP) it becomes an independently testable element of the primary barrier envelope.